A major new report which analyzes 4,000 cities to demonstrate the health, climate and biodiversity benefits of source water protection. It illustrates how nature-based solutions such as reforestation, forest protection, and improved agriculture practices can be implemented at a scale to make a difference in mitigating and adapting to climate change, conserving biodiversity, and contributing to the health and well-being of billions of people. The analyses find, for instance, that source water protection activities could reduce the risk of regional extinctions; contribute 16% of the climate change mitigation needed in the year 2050 to keep the world on a trajectory to keep temperature increases under 2 degrees Celsius; and protect 5 percent of the economic value of global agricultural production by safeguarding pollinator habitat. Water funds are specifically explored as a successful mechanism for downstream water users to fund upstream land conservation and restoration. The report finds that one in six large cities around the world could pay for source water protection through water treatment savings, and that the stacking of other co-benefits could make source water protection affordable for additional cities. Approximately a third of the world’s hundred largest cities rely on forest protected areas to supply a substantial amount of their drinking water. 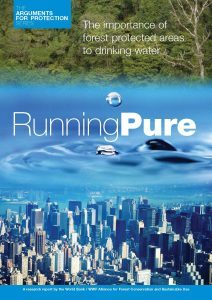 This book reports on the research that produced the statistics; demystifies the links between natural forests and water resources, including drinking water; looks at the environmental and social implications; and gives a number of detailed case studies from around the world. It is the first in what we plan to be a series of wider “arguments for protection” looking at wider benefits from protected areas. A short animation film on river management. A short fact sheet from the Ramsar Convention Bureau.